On Saturday, January 17, the Armenian Church remembers four early Christians, the Hermits Anthony, Tryphon, Barsauma, and Onouphrius. Of the four, Anthony is the best known. He lived during the time of our Lord and he heard the words spoken by Jesus to a wealthy young man advising, “If you will be perfect, go and sell all that you have and give it to the poor and come follow me.” Anthony did exactly that, lived as a hermit, preached the teachings of Jesus and encouraged others to follow his example. The place he selected to live became the site of the first monastery; and he is therefore recognized as the father of monasticism. Posted from the Eastern Prelacy of the Armenian Church’s Weekly E-Newsletter. This Saturday, February 23, the Armenian Church commemorates St. Cyril (315-386) of Jerusalem, a doctor of the church. St. Cyril had a pleasant and conciliatory disposition, but he lived at a time when bishops were embroiled in bitter controversies and were quick to condemn any attempts at compromises, even calling such attempts as treason. Sixteen years of his thirty-five years as a bishop were spent in exile. When a famine hit Jerusalem, he sold some of the possessions of the church to raise money for the poor starving people. He was condemned for selling church property and was banished. His best known work that has survived, “The Catechetical Lectures,” is believed to be one of the earliest systematic accounts of Christian theology. The lectures consist of an introductory lecture, followed by eighteen lectures on the Christian faith that were used during Lent for those preparing to be baptized on Easter, and five lectures on the sacraments to be used after Easter. The lectures have been translated into many languages, including English and Armenian, and are noted for their presentation of the Christian faith in a positive light and maintaining a balance between correct belief and holy action. Week observances in Jerusalem in the fourth century is available thanks to a woman named Egeria, believed by some to be a nun, who made a pilgrimage to Jerusalem and wrote letters describing the liturgical practices. This Saturday, December 8, the Armenian Church remembers St. Nicholas the Wonderworker, a fourth-century Bishop of Myra, Lycia in Asia Minor (modern-day Turkey) and a defender of orthodoxy. Because of many miracles attributed to his intercession he is called “the wonderworker.” He was also known as a secret gift-giver and is believed to be the model for Santa Claus. This Saturday, July 7, the Armenian Church commemorates the “Feast of the twelve apostles of Christ and Saint Paul, who is considered the thirteenth apostle. Jesus selected twelve apostles to carry on His work and instructed them to preach and to baptize converts all over the world (Mt. 28:19-20). He gave the title “apostle” to the twelve (Luke 6:13; Mark 3:14). The word apostle derives from the Greek word apostellein (arakyal in Armenian). The apostles dedicated their lives to spreading the Word and fulfilling the sacred mission entrusted to them. Their mission was not just to transmit the message, but to put it into practice. Paul was initially an enemy of Christians and persecuted them. He had a vision on the road to Damascus and became a fervent Christian convert and was subsequently responsible in large measure for the rapid spread of the new religion. Most of the New Testament (aside from the four Gospels) is from the writings of Paul. 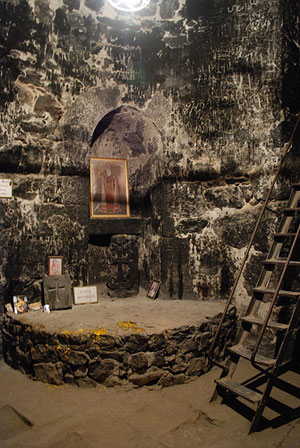 The Armenian Church has its roots in the apostolic ministry and succession (Thaddeus and Bartholomew) and is therefore known as “apostolic,” (arakelagan). The apostles and their immediate successors (including the Armenian Church) defended the Orthodox faith and kept it pure. During Great Lent, saint days are commemorated only on Saturdays. During the remainder of the year saints can be honored on Mondays, Tuesdays, Thursdays, or Saturdays. Never on Wednesdays or Fridays, these being fasting days. This Saturday, March 24, the Armenian Church celebrates one of the three days in its liturgical calendar devoted to St. Gregory the Illuminator, the patron saint of the Armenian Church. The three days are: Entrance into the Pit; Emergence from the Pit; and Discovery of his remains. This Saturday is the commemoration of his commitment to the Deep Pit (Khor Virab). Gregory maintained his faith and refused to renounce Christ. As a result he endured many tortures and his final punishment was banishment into a deep pit where he remained for a period of thirteen or more years. Miraculously he survived, thanks to his faith and a woman (identity unknown) who lowered food and water into the pit. The Monastery of Khor Virab is a popular destination for tourists and pilgrims who visit Armenia. The monastery was built on the exact location where St. Gregory was imprisoned. The pit is accessible and it is possible for visitors to climb down the ladder (27 steep steps) into the pit. The church, named Sourp Asdvadzadsin, dates to the 17th century. The area is one of the most beautiful in Armenia and provides the absolute best view of Ararat from anywhere! The area surrounding Khor Virab is the site of the ancient Armenian capital, Ardashad, founded by King Ardashes I about 180 BC. Come, let us exalt on this day the spreader of the spiritual light to us who sat in darkness, the holy patriarch Gregory. Come, you children instructed by him, exalt on this day the distributor to the sons of Torkom of the undefiled gifts of the Holy Spirit who gave us a new birth as sons of the light. Come, you children instructed by him, exalt on this day the interpreter of the divine word in the land of Armenia. On this day the Church and her children sing with the angels, on this day of memory of the enlightener ascribing glory to God in the highest. St. John, Patriarch of Jerusalem, succeeded St. Cyril as Patriarch of Jerusalem (386-417). He grew up with the monks at the monastery of Nitria (Egypt) where he learned about Christianity and the teachings of Origen. He was noted for his keen intellect and is said to have delivered inspiring and eloquent sermons. Hovhan Odznetsi (St. John of Odzoon) was catholicos from 717 to 728, which was a period when Armenia was under Arab rule. He defended Armenians from forced conversion and was successful in securing the right of worship for Armenian Christians. He was also successful in securing tax-exempt status for the church. He was highly admired and respected. Hovhan Vorodnetsi (St. John of Orodni) was born in 1315. Following his ordination he served at the monasteries of Klatzor and Datev. He dedicated most of his efforts toward the preservation of the orthodox faith, and against the attempt to merge the Armenian Church with the Latin Church. He wrote commentaries on the Gospel of John and the epistles of St. Paul. This Saturday, February 25, the Armenian Church commemorates the life of Theodore the Warrior, a captain in the Roman army during the reign of emperor Licinius. Theodore was born into a Christian family and was educated in the teaching of Christianity. He was noted for his bravery, and was noted for killing a serpent that was terrorizing people and animals. 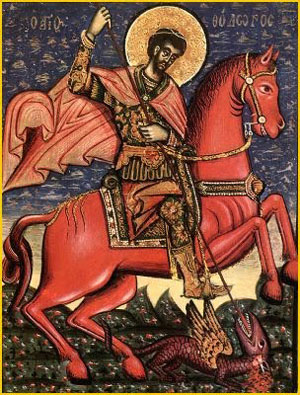 Theodore armed himself with a sword, and with a prayer to the Lord vanquished the serpent and became a heroic figure. He was appointed commander of Heraclea where he combined his military duties with the preaching of the Gospel. Soon nearly all of Heraclea had accepted Christianity. Emperor Licinius began a campaign against the Christians. Theodore was a main target. He was arrested and given an opportunity to renounce his Christian religion, which he refused to do. He was martyred in 319 A.D. in Heraclea, Thrace. Posted from Armenian Eastern Prelacy’s Crossroads E-Newsletter.